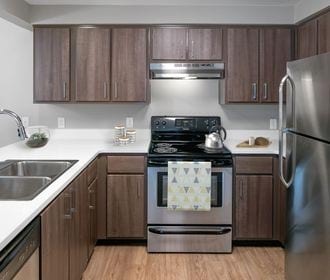 Discover the stylish apartment homes and unique living experience offered by River Terrace, a contemporary community ideally situated in Eugene, with easy access to Springfield as well. When you select a one or two bedroom residence for rent in this pet-friendly community, you’ll discover what makes River Terrace a special place to call home. 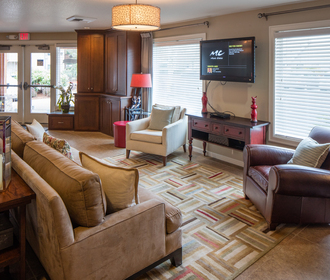 From dynamic interiors to luxurious amenities, you’ll find comfort and charm at every turn. The remarkable design of your new apartment home is apparent when you cross the threshold. You’ll notice the spacious and bright interior, with living space extending to the outdoors on the expansive patio or balcony. Imagine the gourmet meals you can prepare in the chef-style kitchen with European cabinetry. Laundry is a breeze with the full-size washer and dryer set provided. The luxury continues on the park-like grounds of this beautifully landscaped community. Lush landscaping surrounds social spaces that include picnic areas placed throughout the community, an outdoor sports court, an on-site dog park, a heated swimming pool and spa and an outdoor kitchen. 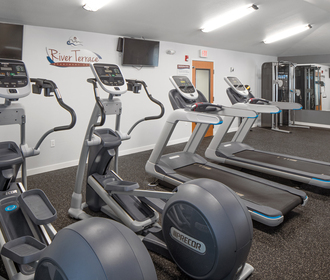 Residents also enjoy access to a community lounge, fitness center and indoor basketball court. Call today to learn more.